Frank Castle packs a pretty mean arsenal of tools and skills to battle against the criminal underground of the Marvel Universe. As an ex-soldier trained by the United States Marine Corps, he has an advanced knowledge in military grade weapons. Heck, his pantry probably has a full array of firearms and explosives instead of breakfast cereals. His opponents can’t even get a chance to outsmart him, since he has trained in expert level combat tactics with the Navy SEALs. But do you know what his most intimidating skill is when it comes to fighting crime? It’s his taste in costume design when creating his Punisher costume! You see, as The Punisher, he can’t run around in bright colored tights like some of those other superheroes. He doesn’t have invulnerability like Wolverine to protect him and he can’t exactly web-sling his way out of a bad situation like Spider-Man. Instead, he wears a combat vest with a deadly skull on the front. This shows all the bad guys that he means business and he’s about to open a can of you-know-what on their sorry butts. It makes his enemies not even want to fight him. 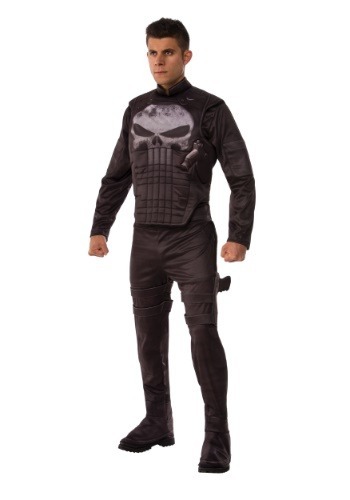 Now, it’s pretty easy for you to step into Frank Castle’s signature crime fighting attire with this deluxe Punisher costume for adults. It comes with a jumpsuit that has a foam chest piece made to look like body armor. It also has foam holsters attached to each leg for holstering your toy pistols. You’ll have a look that’s ready to crush your enemies and see them driven before you!